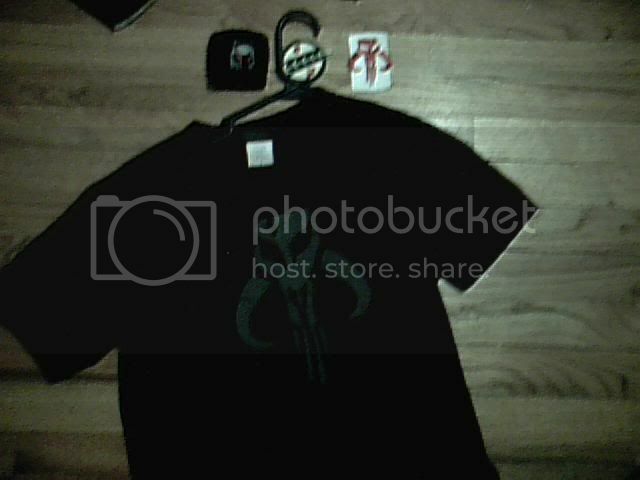 Wow nice thats alot of stuff. Very cool, dude. Welcome to the addiction. 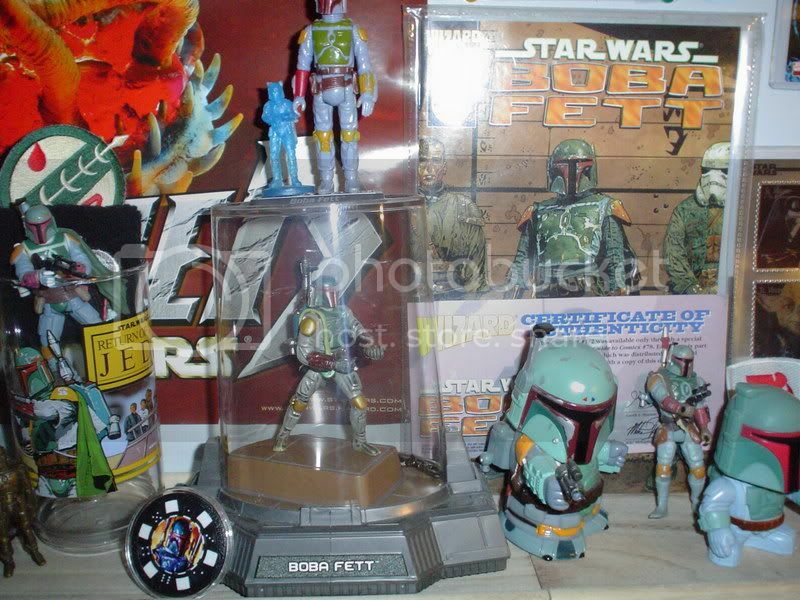 If you ever get the money, or get the chance to grab one pretty cheap, get one of those Kotobukiya Boba Fett vinyl model statues. 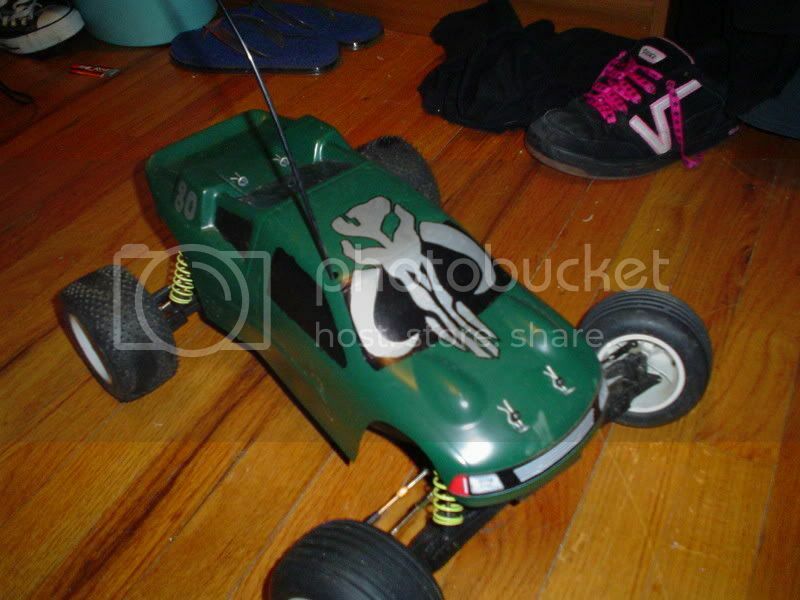 They usually run about $60 on eBay. 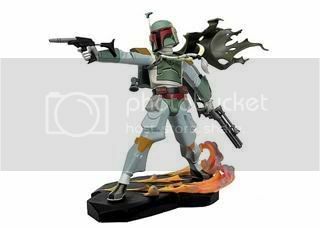 I think that is one of the nicest Fett items to come out in a long time. 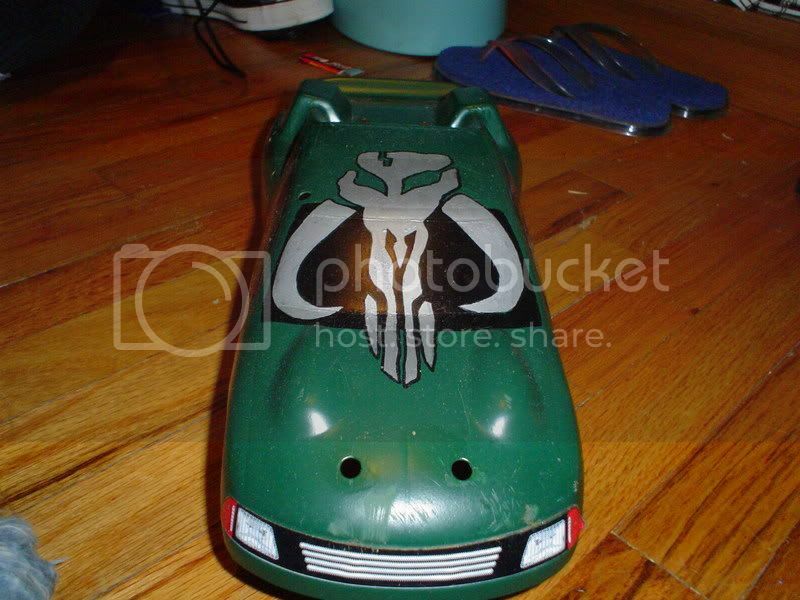 Very, very nicely molded. 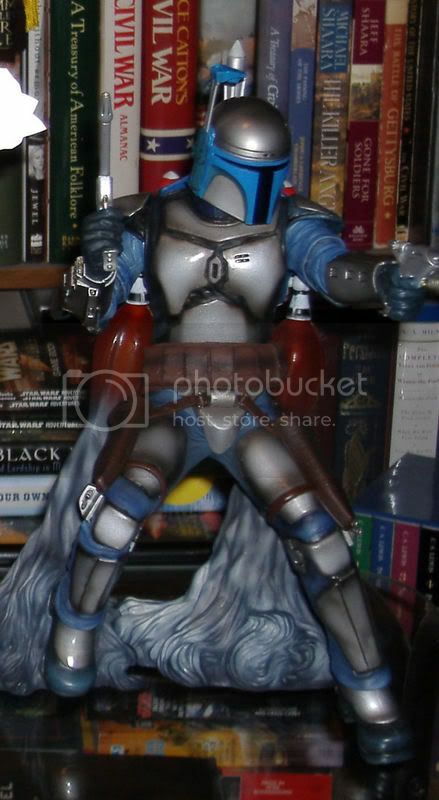 The Jango Fett Kotobukiya statue I didn't like so much. I think it was the pose they picked for his statue. 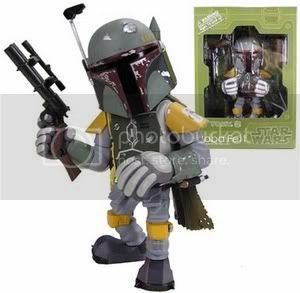 However, the Boba Fett version is really awesome. It was a lot bigger than I thought it'd be, too. Those are sweet. 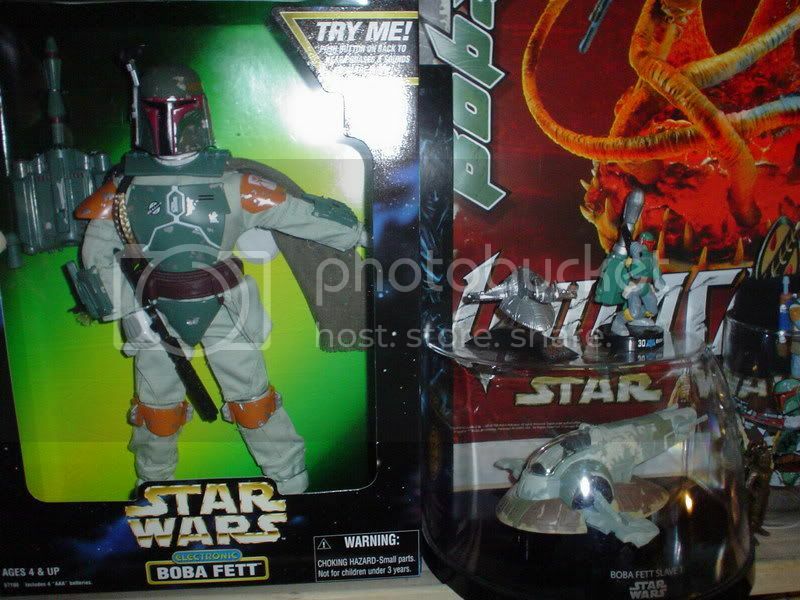 there were two on amazon with the slave 1 and Fett with a carbon-frozen solo next 2 him. 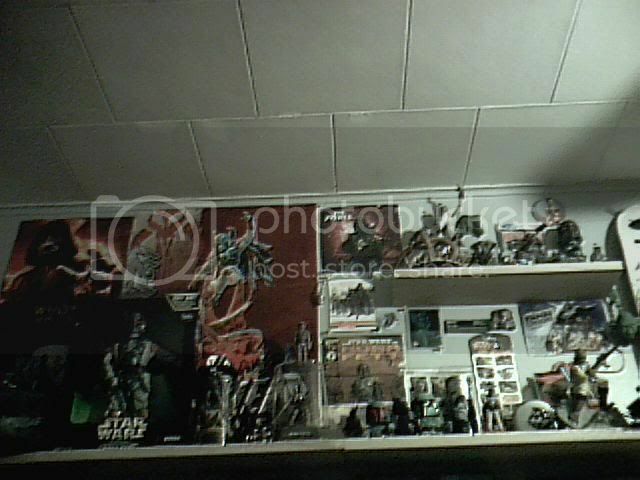 Wow nice stuff:P thats a good collection. 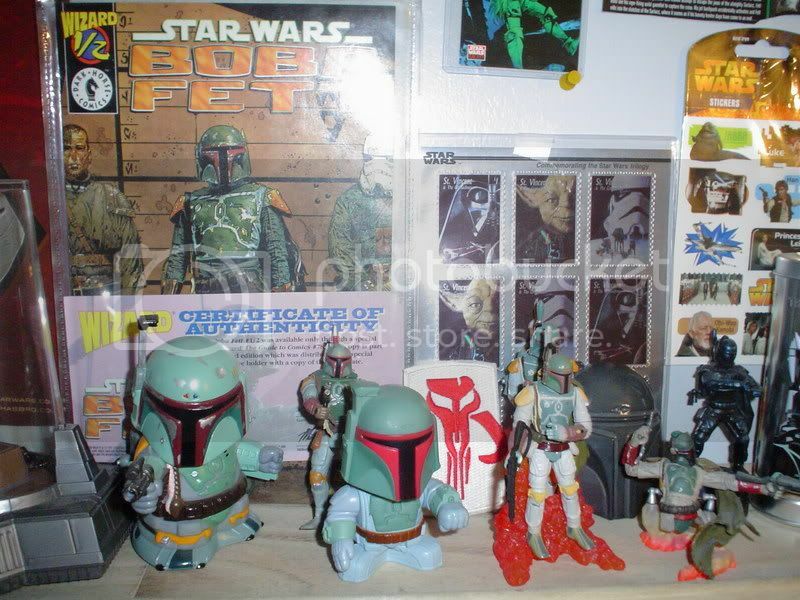 Wow, you guys have massive Fett collections! My collection is tiny. 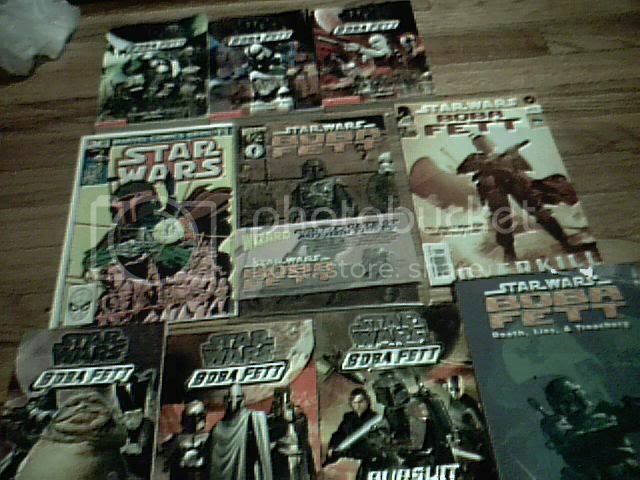 Nice collections especially Sadriel and Dageen! omg!! 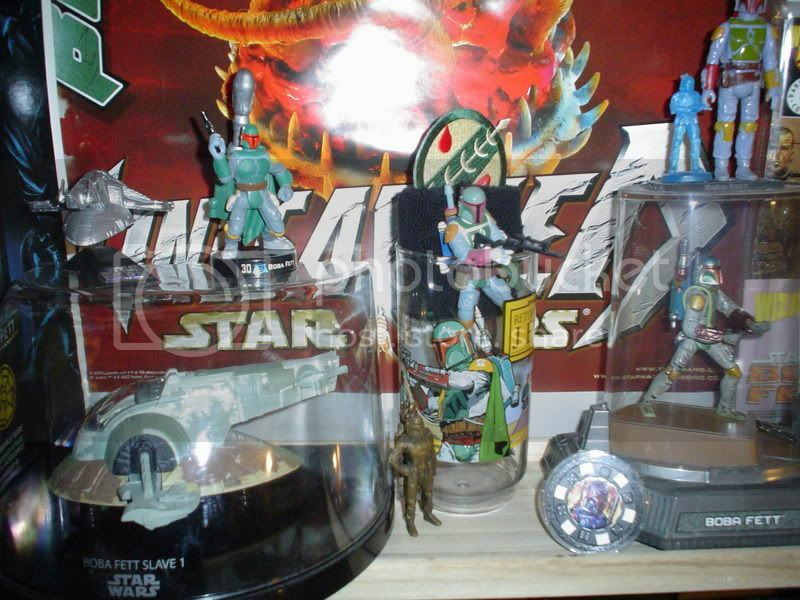 Youre Fett collection is the best one I've ever seen!!! 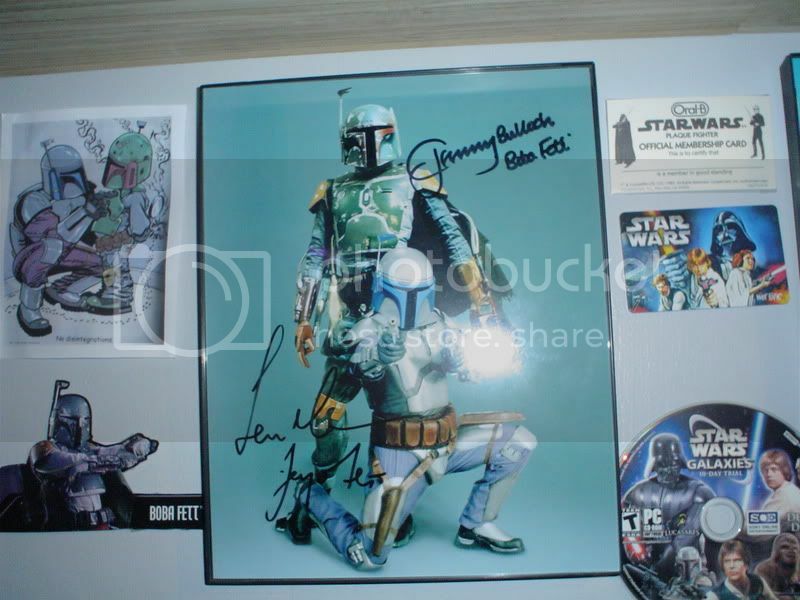 Thanks Miba, I know I'm a mega-geek, but I'm sure there are some better ones out there. 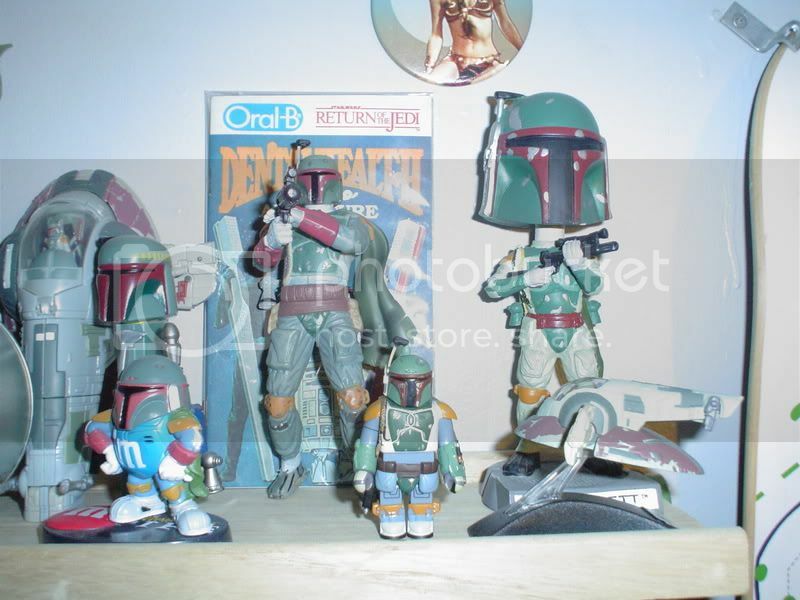 There's actually this one guy, I think he's from Japan, that has a site with a lot of Boba Fett stuff posted on it. 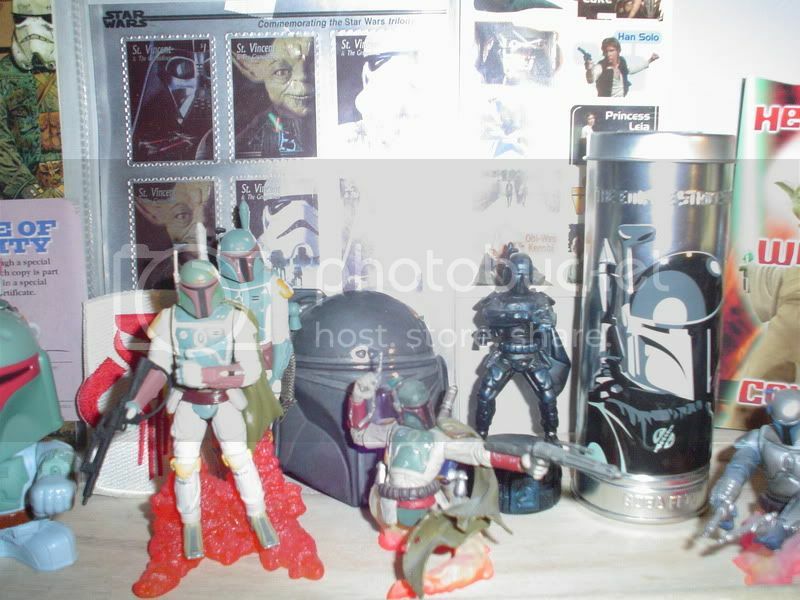 His collection is very meticulously photographed, too. I can't think of it off the top of my head, or find it in my bookmarks. When I find it, though, I'll post the link. He's got some really good stuff. Hey, Aaron already posted the link on another thread, but this is the Japanese guy's website I was talking about above. 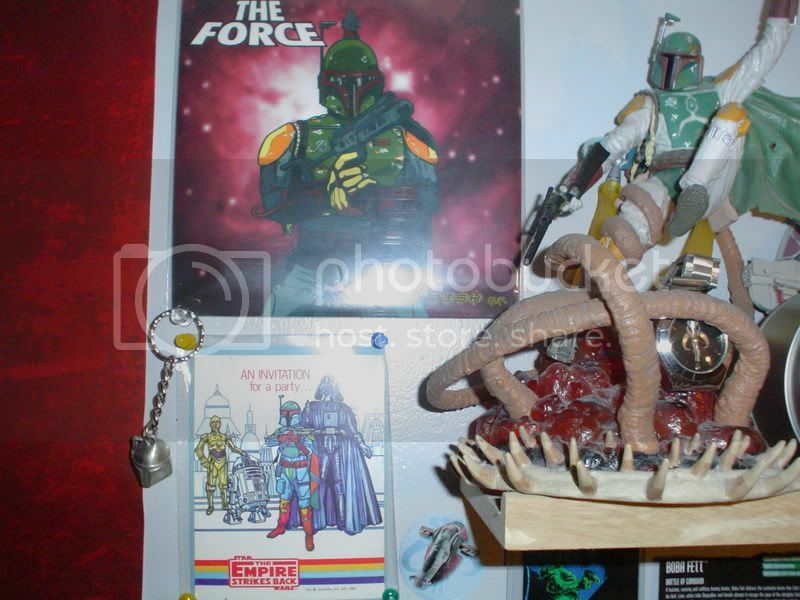 i just added a slave 1 key chain to my collection along withthe 1998 Official Boba magazine, which is so extremely outdated on facts ( still believe he is Jaster) and it is quite the giggle, but it has some good info on stuff too, a very nice addition to any collection and twas only 5$ on ebay...sweetness...now just waiting for Maquette from Sw.com hehe. 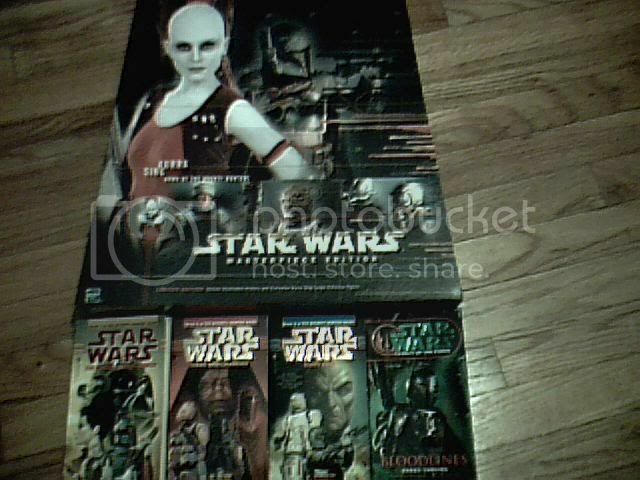 It has not come yet, but I recently added a mint-condition "Delux" figure to my collection for sixteen dollars. I think that that figure is official. 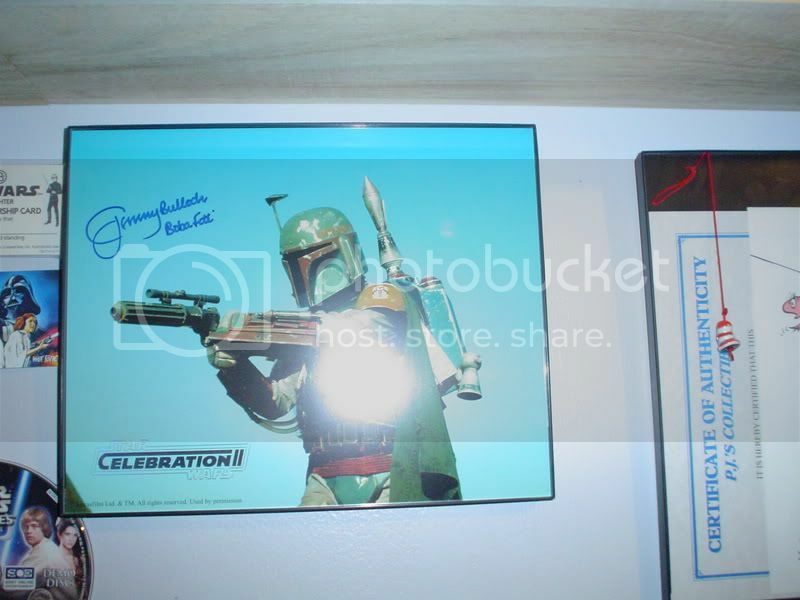 Oh, I thought it might be a custom one, because it doesn't look like it has a Boba Fett coin on it and it looks like it has a red background behind the figure. 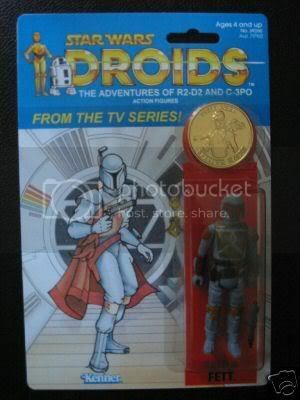 Hard to tell in the pic about the coin, though. 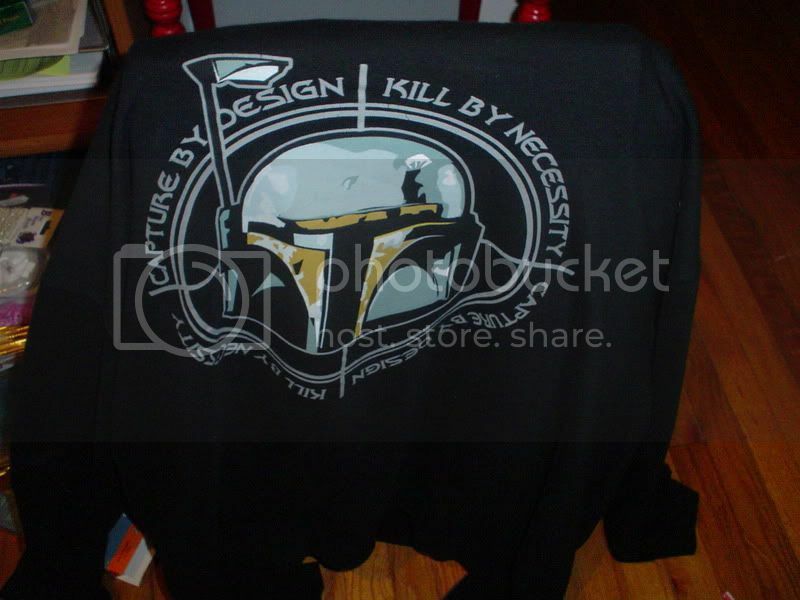 Did you get it from the seller called "purestarwars?" not sure i will double check later and update the post. 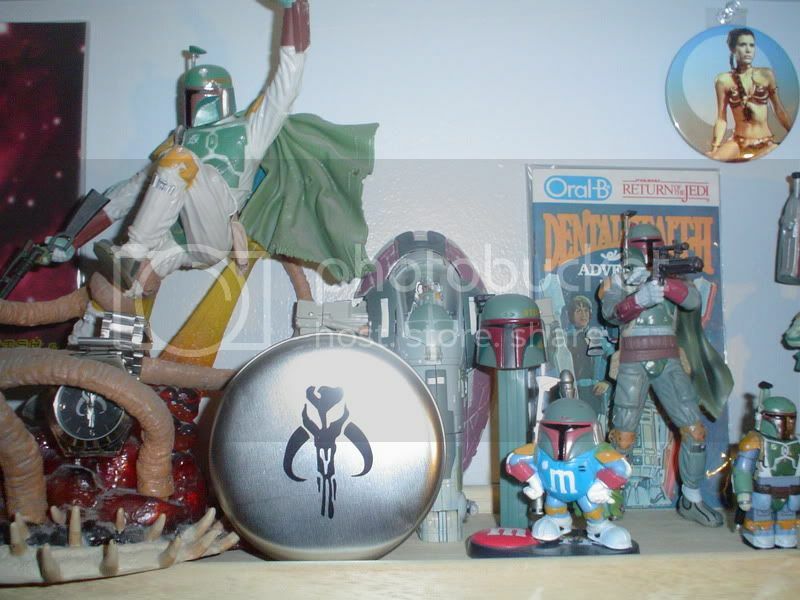 Sadly you wer correct Sadriel, twas not even a fett coin in it, it was Thul, and it was a dark orange background, it just came in so i am debating i i should send it back or keep it. 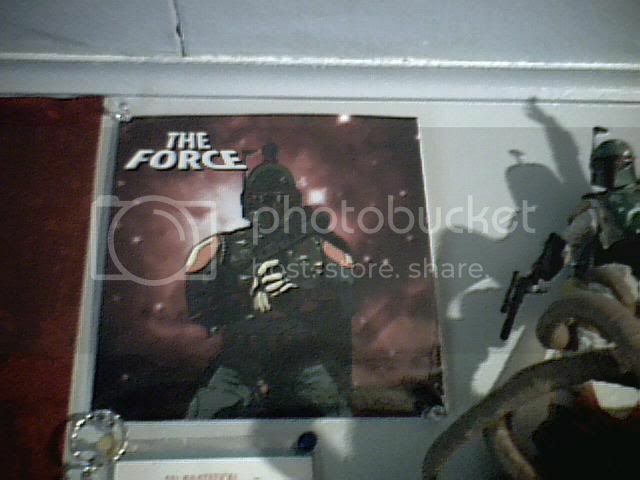 because it is the closest thing i will get to one w/o spending a few grand.---also just added the Galactic heroes figure to the collection...8$ but hey you cant find them in stores anymore. You can still keep it, dude. It still looks really good. Whoever did the card did a really good job on it. 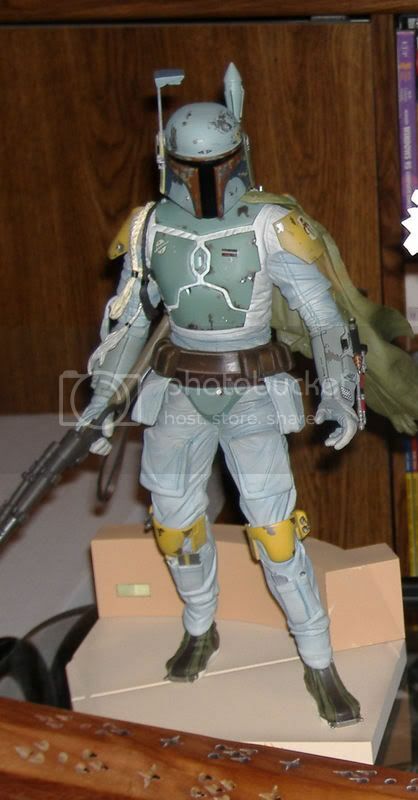 i prolly will only downside is that it has a thul coin:( but i just added the riddel .45 scale helmet friggen sweet! i needa take abreak form collecting and think about putting some money aside.